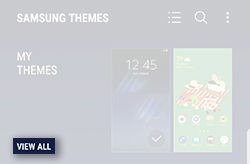 Galaxy S8: How do I manage themes and icons on my Samsung Galaxy S8 (SM-G950W)? You can customize your Galaxy S8 themes and icons to your taste. 1. From a Home screen, touch and hold an empty area. 2. Touch Wallpapers and themes. 4. To view all of your themes, touch VIEW ALL. 5. Select the desired theme. 6. View the details and then touch APPLY. 4. To view all of your icons, touch VIEW ALL. 5. Select the desired icons. 6. Review the following information and then touch APPLY. 4. Swipe up to view the available themes and then select the theme you want to download. 4. Swipe up to view the available icons and then select the icons set you want to download.